We recently reported how local opposition against the Khudoni hydropower plant project in Georgia is being stifled by government figures and how people were intimidated to avoid negative reporting on the subject. The native communities in the Svaneti region are protesting against the project which would expel them from their land and way of living. The dedication of the Svan communities has triggered solidarity across the country. While protests against the Khudoni dam are becoming a regular feat, many famous supporters have now joined the protests publicly. 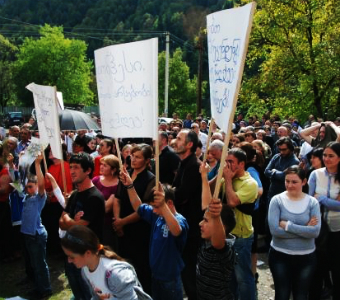 Rallies against Khudoni took place on Tuesday, October 2 in Tbilisi, Mestia (an important town in Svaneti) and Kaishi (one of the towns to be flooded). In Mestia, representatives of different communities from Svaneti and environmentalists gathered in front of the State Office and demanded to stop the Khudoni dam project. Ethnic Svan communities in the beautiful Svaneti mountains face being resettled for a project that is unnecessary. Locals affected by the Khudoni dam not only fear being resettled away from the beautiful mountain region they call home. They also have no reason to trust the government’s promises that “resettlements will be conducted according to highest possible standards in the world” (Ilia Eloshvili, Deputy Minister of Energy, Source [KA]). Land rights have only very weak protection in Georgia and authorities have blocked Svans from registering their property in recent years. Many land plots that were under customary use by the Svans have been sold off for one dollar to the Khudoni investor Transelectrica, a company registered in a tax haven. In addition, the Minister of Energy Kakha Kaladze has been criticised for a potential conflict of interests since he has invested in Georgia’s energy and natural resources sector before joining the government one year ago. 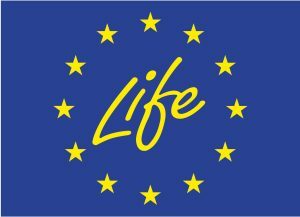 Already more than 200 people took an oath against the project. Manana Saghliani, one of the villagers even threatened to commit suicide [KA] by self-immolation at the project site should the project proceed. While protests are ongoing, the Ministry of Energy has so far not indicated to change course regarding Khudoni.